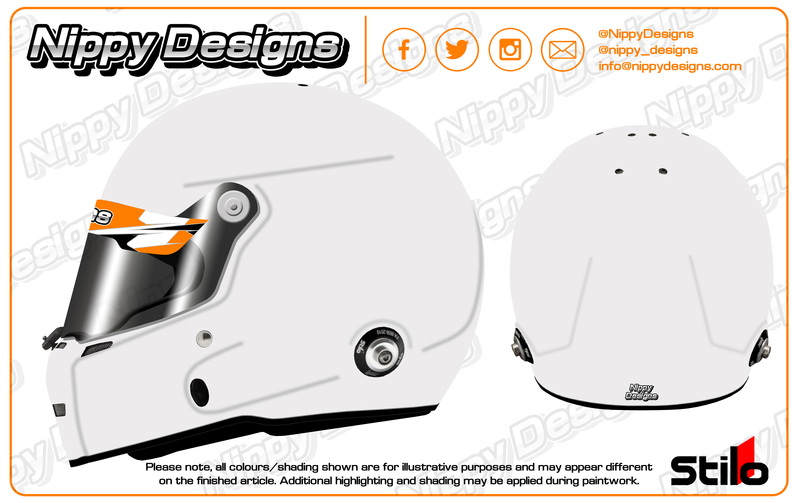 Nippy Designs are specialists in motorsport helmet paintwork, created for the fastest athletes. 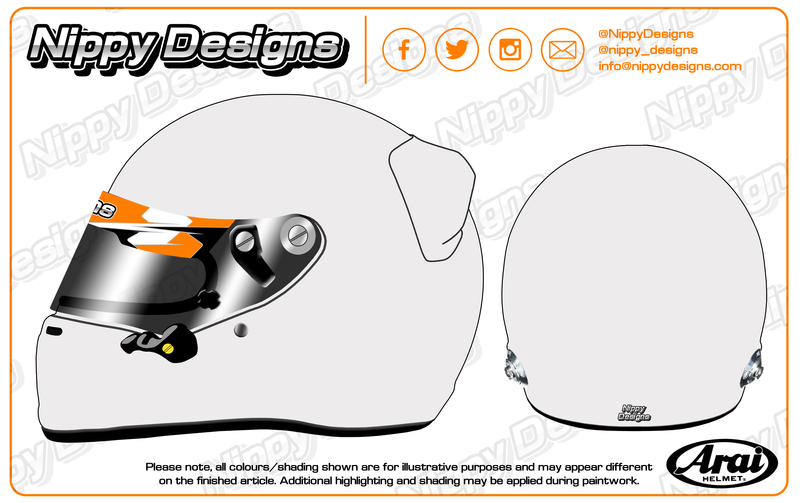 Understanding the need for a custom helmet in the world of Motorsport encouraged Craig Hook - the owner of Nippy Designs, as a long time karter, to endeavour to design unique helmet paintwork that reflects a driver's individuality. We believe that a custom paint job on a helmet shows a driver’s individuality; therefore we would not want to copy another driver’s design. If you need any help creating your design we would be happy to work with you to and create a design that suits you. If you send through the kind of things you like we can create a computerised design for a small fee. We are here to help so are more than happy for you to come and see us to discuss your design in person. The colours used for the paintwork, unless specifically stated otherwise with colour codes or references, will be chosen by us to what we believe your description suggests and would go best with your design. We can cater for all designs, ranging some simple classic and retro layouts, all the way up too complex layouts with multiple effects, elements and even chrome finishing. Our design process for Enquiry to Delivery is available below, please feel free to Contact Us for more information. View our Gallery and Social Media Instagram Feed for our latest work to see more of what we can do. Get in touch with us for a quotation on your next helmet paintjob. Simply get in touch with us via our contact methods to enquire about your next custom helmet paintwork order. Feel free to contat Nippy Designs via Phone, Email or by using the Contact Form on our website. We will need to know a few standard requirements in order to give you price quotes and rough estimates on lead time for the paintwork completion. Various other items such as if you require us to order you in a new helmet, prepare an existing one, require chrome on your helmet and any other accessories needed in your order. Design lead times vary dury the time of year. The busiest period is often during the winter period, when all racing is off season. (October - February) So we advise to get your booking in early to avoid dissapointment! You can come to us with a pre-made design, sketches, or, if you’d like help in coming up with something new and unique, we are happy to help! We have a design service, prior to paintwork, where we will work with you to computerise your ideas! Use our contact page to get in touch! 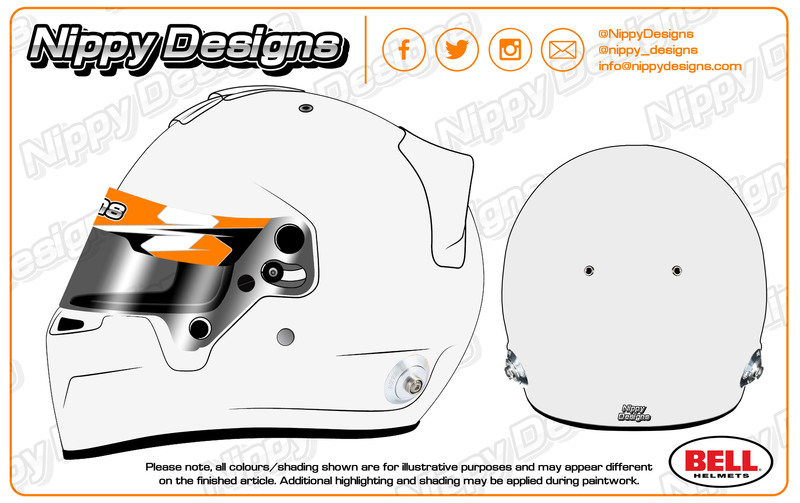 Here you can find our design templates for Arai, Bell or Stilo helmets. We have a range of helmet templates, for different helmet models where you are able to draw / sketch your own designs for a free quotation. Booking with Nippy Designs requires a deposit before the paintwork is started, with the remainder require upon completion. To book a paintwork slot, we will require a £200 deposit. Once the deposit is received, we will confirm a booking slot for you. In peak times, we can be taking bookings 3-4 months in advance, so make sure you get in contact to avoid missing out on your deadline. We appreciate you may be running on a tight deadline, so get in contact and we may be able to accommodate you, subject to our bookings at the time and an express turn around fee. As an Arai dealer, you can purchase a brand new helmet and accessories direct from us! We would require the cost of the helmet upfront and this would act as your deposit to book a slot. Once paintwork is completed, the remaining balance must be paid and cleared, prior to us sending the helmet back to you. For payment, we accept cash, cheque, bank transfer or online payment via our invoicing system. The last stage of the process, completing your helmet and posting it back to you - ready for your next race! Depending on the complexity of your final design, paintwork will take 3-4 weeks to complete. Nearing completion, we will contact you to confirm the expected completion date and forward the remaining balance invoice to you. Upon payment of the final invoice and you have confirmed the return address, we can arrange our courier to return your freshly painted helmet to you! Once you have your new Nippy Designs helmet, you are ready to then hit the track, waiting to be the envy of all your friends and rivals on track! We will showcase images of our designs on track, so keep an eye on our social media pages to see if you feature. A range of Frequently Asked Questions, which can answer a vast majority of common requests when using our service. If a question you have is not listed below, please Contact Us and we can get back to you as soon as possible with an answer. 1. How much will paintwork cost? We require a non-refundable £200 deposit to secure a paintwork slot. Depending on the time of year, we can have a 2-3 month waiting list, so booking early is advised. 3. Can I buy a helmet from you? Yes. We are an Arai dealer; therefore we can supply all Arai helmets and accessories. 4. Can you help design my helmet, prior to paint? We love helping our customer’s come up with a unique and personal design, prior to paintwork. We do charge for the design time, but once agreed, all we need are some sketches, a brief description, or some reference images of the sort of styles you like. 5. How long does it take to complete paintwork? Once we receive your helmet, in time for your booking slot, paintwork will take 3-4 weeks, depending on the complexity of the design. Having chrome will add to the lead time. 6. Can you paint my used/painted helmet? In short, yes we can. It all depends on the condition of the used helmet. We ideally would like to work from a new helmet as this provides the best results. An extra preparation fee would apply to having to repair a used helmet. 7. I have seen someone else’s design that I really like, can you copy it? This is a definite no no. We will not copy another driver’s design as this is personal to them. We can help you come up with something unique and personal to you.